FIELD OF DREAMS. 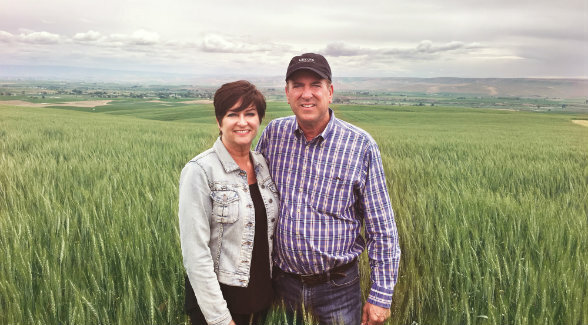 Winter wheat surrounds Jennifer and Tim Weidert on their Washington farm, which descends to the Walla Walla River valley. Oregon’s Blue Mountains line the horizon. Over the last half century, the Weiderts have created a powerhouse of a farm. Their next step? Find someone to take it to the next level. As a Texan, I’m all too familiar with the brag “Everything is bigger in Texas.” Not sure who coined that worn-out slug, but I can assure you he/she/they never set foot in Eastern Washington. That there is some Big Country. Big can obviously refer to scale. One could start with the sheer volume of the mighty Columbia and the enormity of the Gorge, but that would mark the return of the Texan yardstick. 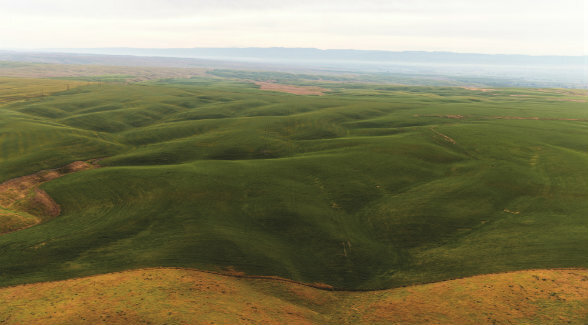 Consider instead the sheer brawn of the Columbia Valley – the number of turbines needed to harness the wind, dam after dam charging the Northwest power grid; and the endless array of different farming operations – boutique vineyards, fully mechanized apple orchards, mile after mile of corn stalks, mustard-colored fields of grass. Without realizing it, Tim Weidert fuels this perception not long after we meet at the Tri-Cities Airport. Tim is more than affable. Think of him as a good friend you’ve never met. Same with his wife, Jen. The moment you say hello, the conversation slips into that zone you share with a longtime bud. As we drive to his farm, he casually points out a few of the landmarks where he grew up, this Big Country called Eastern Washington. Truckloads? No. Carloads. Railcar loads. Beginning with a 600-acre purchase 50 years ago, the Weiderts have increased the size of their farm tenfold to 6,000 acres. Simultaneously, they acquired state-issued, privately owned water rights that are no longer being granted. As I was soon to see, there may not be many people west of Pullman or north of Pendleton, but the few that are out there definitely know how to harness what the good Lord has given them. That group of hardy souls would include Tim’s father, Levi, who was born in Walla Walla in 1923. Walla Walla also happens to be where Levi met Tim’s mother, Loretta, and where Tim would meet Jennifer decades later. Land Lesson No. 1: AGGREGATION | Typically, when a tract doubles in size, value per acre decreases by 10 percent. With top-tier properties, however, as acreage increases, so does value per acre. Levi and Loretta’s story speaks to the best of America’s Greatest Generation: his wartime service in the US Army, her raising their son and daughter, their seeking better opportunity by moving south to Oregon to establish their own dryland farm. Levi and Tim also acquired state-issued, privately owned water rights during that half century. Today, these water rights are priceless. Why? Because the permitting agencies that issued them have stopped doing so. ¡No más! 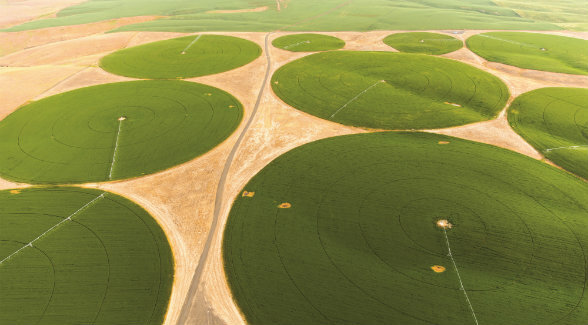 The farm’s computerized management system draws from four deep basalt wells — a fifth is permitted — and controls 35 pivots. The 68° well water percolates down from the Blue Mountains through layers of basalt en route to the Columbia River. It requires no treatment. In addition to excellent soil and plentiful water, Weidert Farm benefits from superior air drainage, a topographical feature that facilitates the flow of cold air downhill. This feature is of vital importance to grape growing. Weidert Farm has emerged as an agricultural powerhouse. In 2017, 3,139 acres of winter wheat were harvested. In previous years, other crops have included corn, potatoes, onions, peas, alfalfa, and Timothy hay. And to Stuart Turner, that’s just the tip of the iceberg. “Everything is right here, right now for this farm to go to the next level,” Stuart tells me. A consulting agronomist based in the Tri-Cities area 25 minutes north of where we’re standing, he insists that the farm’s water, soil, and climate are capable of far more than the row crops currently being produced. “Nature has made it this way,” he says. Land Lesson No. 2: AIR DRAINAGE | As air cools, it becomes more dense and flows down natural drainages. This provides protection from winter freezes and spring cold snaps. There’s one catch with Stuart’s analysis. That’s where Steve Bruere comes in. 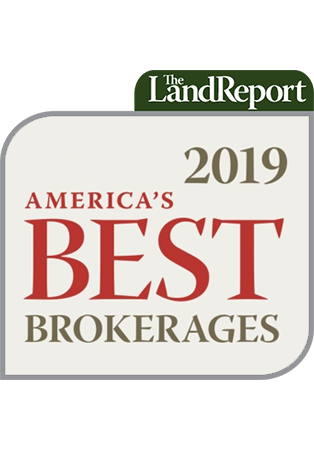 Tim and Jennifer met the Des Moines-based broker at the Land Investment Expo that Bruere’s Peoples Company hosts annually. When they explained their intent to sell their farm, Bruere recommended several leading ag brokerages, but the Weiderts wouldn’t have it. They insisted on working with Bruere. Over the last six months, the Iowa native has crisscrossed the country, sharing the details of this standout property. “I’ve been in front of every major apple grower and all the top apple packers in Washington. I just got back from a wine symposium in Napa where I met with a ton of California wineries. I’ve met with pear guys, cherry guys, blueberry growers, and hops guys. And that’s not including the investment funds that want in,” he says. Peoples Company is offering Weidert Farm via a sealed-bid auction with a November 10 deadline. For more information, a bid packet, and a slew of informative videos, go to www.WeidertLand.com. Turning winter wheat into award-winning wines. Alan Busacca is the college professor you always wanted but never had. That would be because you didn’t go to Washington State, where Busacca has been honored as a professor emeritus. A certified soil scientist, Busacca’s forte is land — nurturing it, studying it, and evaluating it to develop vineyards for Washington’s burgeoning wine industry. Come to find out, he has penned the applications that led to the establishment of several AVAs (American Viticultural Areas) in the Evergreen State. As soon as the Weiderts brought Peoples Company on board to market their farm, Bruere contacted Busacca. Corn and beans Bruere knows cold. Wine grapes? Only in bottle form. Busacca gives me his take on the grape-growing potential of Weidert Farm while standing at the bottom of a six-foot trench in an enormous field. The guy is in his element, and like a true Sicilian, his passion is palpable. 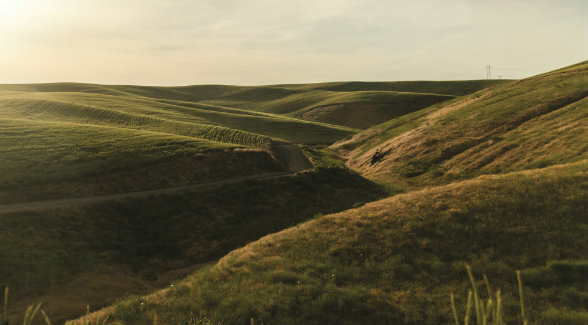 “Vineyards in Eastern Washington have three standout characteristics: the soil, the water, and the growing climate, including the air drainage,” Busacca says. “As air cools, it becomes more dense. Much like water, dense air follows the topography and flows down natural drainages. From a vintner’s standpoint, this is essential. It prevents winter damage and spring and fall frost. Weidert Farm has superior air drainage. It sits high up relative to other wineries in the Walla Walla AVA. It gives you safety from the winter freeze, and it gives you safety from spring frost on your bloom,” he says. Later that day in Walla Walla, Busacca morphs from soil scientist into tour guide. 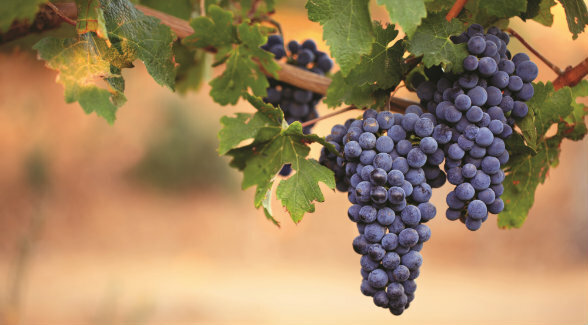 “It has the potential to grow mid-season to late-season ripening grapes — Chardonnay, Cabernet Sauvignon, Petit Verdot, Petit Syrah, Syrah, Merlot. I’ve never seen anything like it.